Kumamoto Prefecture (熊本県,Kumamoto-ken) is a prefecture of Japan located on Kyūshū Island. The capital is the city of Kumamoto. Historically the area was called Higo 肥後　province and was renamed to Kumamoto prefecture during the Meiji Restoration as part of the abolition of the feudal system. The current Japanese orthography for Kumamoto literally means "bear root/origin", or "origin of the bear". Mt. Aso, Aso san　阿蘇山 (1592 m), an extensive active volcano, is in the east of Kumamoto Prefecture. This volcano is located at the center of the Aso caldera, the most famous caldera in Japan. Kato Kiyomasa, a contemporary of Toyotomi Hideyoshi, was made daimyo of half of the (old) administrative region of Higo in 1588. A lot of horse meat is eaten in Kumamoto. warishita わりした broth at the end of a sukiyaki is eaten with kishimen noodles. It is prepared with sliced sticks of sweet potatoes, carrots and nira leek takes about 3 hours to prepare! A pair of mother and daughter prepare only 30 packs for each sunday, and is always sold out immediately. The station house is an old wooden building. boobura ぼうぶら【南瓜】 (bobura) is the way they are called in West-Japan. From the Portugese abobora. Temple Suizenji is place name in the Kumamoto town area. During the Edo period, the Daimyo Hosokawa Tadatoshi 細川忠利 had build a temple in the area, which was later rebuild elsewhere and thea area became a large park, Joojuu en 成趣園 or Suizenji Kooen 水前寺公園.
. Hosokawa Tadatoshi 細川忠利 (1586 – 1641) . 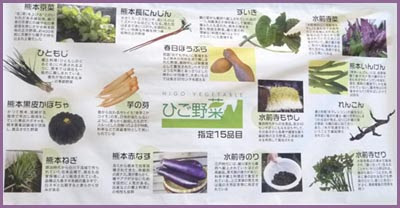 Suizenjina, suizenji na 水前寺菜 "leafy vegetables from Temple Suizenji"
One leaf side is green and the other violet. Amakusa daioo 天草大王 "king of Amakusa"
The meat is also used for a "chicken shabu shabu"
furikake gohan no tomo ご飯の供 "friend of the cooked rice"
Kumamoto was one of the first places to develop furikake, toppings to sprinkle on rice. They also sprinkle it on other dishes like natto and salads. A new one to sprinkle on "rice with a raw egg" (tamagokake gohan 卵かけご飯) is developed, where you put the raw egg on the rice and the topping all around and do not use soy sauce any more. The dried root of a taro is bundled together, looking almost like a male symbol. This root is longer than the normal taro roots, and maybe started being introduced after the first Europeans came to the area. Some say, the cucumber for an European lady, the zuiki for a Japanese geisha! ikinari dango いきなり団子 "all of a sudden dumplings"
There is a local variety of oysters, that is now revived to produce a regional speciality since Autumn of 2009. From 1949 to 1958 these oysters had been exported to the West Coast of America and grown there. local dialect for the utsubo うつぼ, taken from the latin name of the animal. The fish has a very large mouth with strong teeth and can bite the fishermen. It has a very thick skin and many small bones. But through special preparation, it is now sold packed with a miso paste to make a hodgepodge, kidakonabe きだこ（うつぼ）鍋 with a lot of collagen. They are caught in special boats in the Yatsushirokai 八代海. 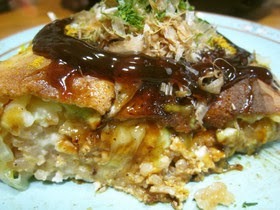 with special toppings of miso paste with mayonaise, shrimp, meat and anything you like ... even with curry taste. It was "invented" by a housewife who told her husband to mix mayonaise with miso (things all kids like) and prepare a simpel fast food for dinner . . . more than 30 years ago, still a favorite of the region. The restaurant now prepares more than 400 meals a day, many for home delivery. Kumamoto is one of the great producing areas. Before the war, a variety with a thick outer skin were produced. After eating the red fruit, the housewife cuts the thick skin off and puts the leftovers, cut to bite size, in a bolw, mix it with salt and let it stay for a day. Even now, with varieties of a much thinner outer skin, this pickle is loved in Kumamoto. This small town is also known for its koinobori carp streamers over the small river in town and its many very narrow alleys with hot spring ryokan lodgings. 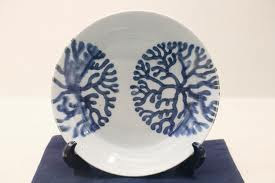 Princess Atsuhime liked this very much. When she travelled by land to Edo, she also found yubeshi in the postal station of Yakage in Okayama 岡山県矢掛町 and ordered more than 500 packs of it to share with others. This siphonous alga is dark green in color. It appears as a fuzzy patch of tubular fingers. These formations hang down from rocks during low tide. First established in 1762 by Ueda Dengoemon 上田伝五右衛門.